Late of Canada's Helix, Nail was formed in 2007 by Ranier and Cindy Wiechmann, releasing in that same year their self-titled debut. Power and Greed is their sophomore follow-up, and follows their original strategy of delivering melodic heavy rock and metal with some noticeable prog influences. Passing through Power and Greed you might be quick to note an echo of stoner rock or doom metal, simply because of the heavy motif. Better to picture early Rush tempered with depth and shadows of Black Sabbath. Yet, there still remains an emphasis on melody and hook as proven on The Devil U Know or SuperHuman. Throughout a strong progressive texture adds depth to the arrangement proving both the inventiveness and skill of the musicians. King of Fools and Bottom Feeder are noteworthy. Following this, kudos go to the excellent performance from guitarist Ranier Wiechmann and bass player Darcy Maudsley, who single-handedly steals the show on Power and Greed. A greater difficultly is the vocal style of Cindy Wiechmann: while strong for rock and metal, my ears rebelled on nearly every song. Nevertheless, because the music is quite exceptional, Ms. Wiechmann my grow on my listening ears. 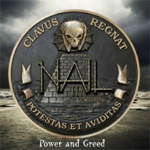 If you like the temper and tone of your melodic rock on the heavier side, with metal notes and progressive influences, Nail's Power and Greed will be an interesting and entertaining proposition.